The John Davies room contains a large selection of historic Masonic items with many dating from hundreds of years ago. These include rare books and manuscripts, porcelain and collections of jewels from the Province of Worcestershire and beyond. Of particular note is a display on 17th and early 18th Century Freemasonry, which includes four copies of the Old Charges: the Woods Manuscript (1610); the Lechmere Manuscript (late 17th Century); the Indigo Jones Manuscript (dated 1607 but more likely to be circa 1720) and the Woodcock Manuscript (circa 1715). 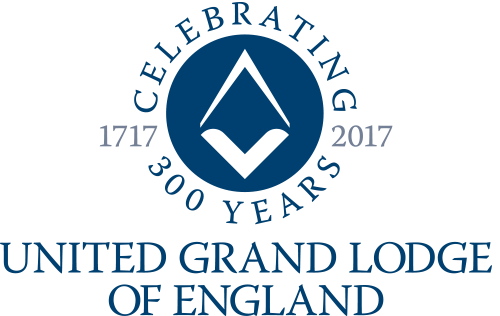 These are sometimes described as the 'Title Deeds of Masonry' and were read in the ancient operative Lodges, a practice that was continued in our speculative Lodges for some time after 1717. 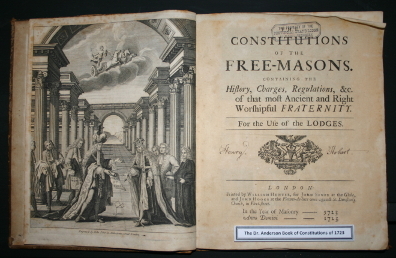 We have an original copy of Dr James Anderson's 'Constitutions of the Free-Masons', which was published in 1723. Dr Anderson, born in Aberdeen circa 1680, was an ordained a minister in the Church of Scotland and moved to London in 1707. Brother Anderson's name does not appear on the title page, but his authorship is declared in an appendix. The notorious Masonic exposure 'Masonry Dissected' (1730), which ran into many editions, is also on prominent display, are are copies of 'The Grand Mystery of Freemasons' (1724) and 'The Beginning and First Foundation of the Most Worthy Craft of Masonry' (1739). As the Library and Museum is situated in the Masonic Province of Worcestershire, the John Davies room contains two displays detailing Worcestershire Freemasonry in the 18th 19th Centuries. These contain collar jewels, two of which were owned by John Dent, the MP for Knaresborough from 1852-1857 and Scarborough from 1857-1859 and 1860-1874. 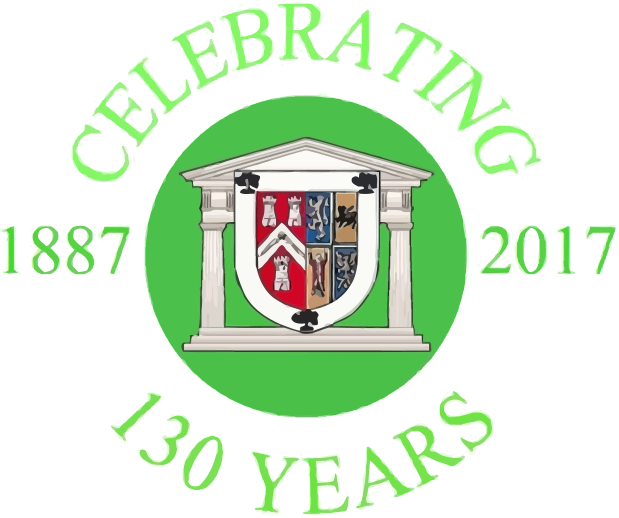 Brother Dent was the Provincial Grand Master for Worcestershire from 1792-1826. Our collection also includes a Past Master's Jewel presented to George Taylor by the Lodge of Hope and Charity No. 377 in 1877. At the back of the room resides a cabinet containing porcelain and other hand-crafted items such as snuff boxes, tea spoons and loving cups. 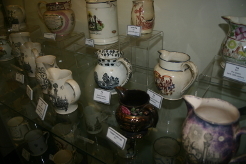 There are various 'pre-union' jugs dating from the early 19th Century, together with porcelain mugs, cups and bowls originating from Leeds, Liverpool and Nottingham. 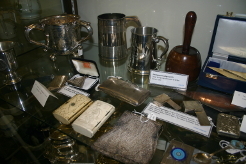 Our more unusual exhibits include a Caribbean coconut rum-flask adorned with Masonic symbols, and a carved cocoa nut with mountings by F. Philips and E. Rolinson dating from circa 1790. On the wall of the John Davies room can be found a time-line of Freemasonry, showing the major events in the world history and how these are linked to the development of the Craft. A mounted collection of 20th Century Worcestershire Lodge and Chapter jewels, together with collections left to the Library and Museum by Brother Ben Marsh JP, a Past Provincial Grand Master of the Province, are also on prominent display. We have a mounted collection of over 50 authorised and unauthorised centenary jewels from various old Lodges, including those from the Royal York Lodge of Perseverance (ancient number 4 and subsequently number 7); Albion Lodge (ancient number 5 and subsequently number 9); and Westminster and Keystone Lodge (ancient number 7 and subsequently number 10). Brother John E. Davies was a Tyler for the various Lodges that met at the Masonic Hall, Worcester. He followed in the footsteps of his father, Brother E. G. Davies, who held this position until 1947. Brother Davies lived at the self-contained flat at one time situated in the Masonic Hall. This flat now forms part of the Library and Museum and for this reason the room has been called the 'John Davies Room'.